Marvel is in the final marketing push for Avengers: Infinity War, which opens on April 27. The Internet is flooded with new TV spots, trailers, interviews, and even behind-the-scenes videos. Every detail is being carefully examined by the fans in the hopes it offers a crucial hint to the film’s plot. Perhaps the most intriguing detail can be found in a series of character posters. These tease members of the Avengers and the Guardians of the Galaxy accompanied by different Infinity Stones. There are five posters, representing the Reality Stone, the Time Stone, the Space Stone, the Power Stone, and the Mind Stone. Intriguingly, Marvel didn’t release a poster for the Soul Stone. It’s true that Marvel is trying to keep the Soul Stone’s location under wraps, but they didn’t omit it from another recent series of posters. So why do so now? These posters may be more important than they look. Fans are excitedly theorizing that these posters link specific Infinity Stones to the characters who’ll interact with them in the film. That’s why there isn’t a Soul Stone poster; Marvel doesn’t want to give away anything about the final Infinity Stone. Let’s run through the posters and see what can be deduced. 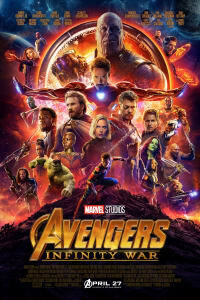 The first poster shows the distinctive yellow of the Mind Stone. It focuses on Vision and Scarlet Witch. That connection makes perfect sense; the Avengers: Infinity War Prelude tie-in comic has revealed the two have retired to the United Kingdom. There, Wanda is attempting to use her powers to help Vision gain mastery of the Mind Stone, which is implanted in his forehead. Set photos have already teased that the Black Order will pursue Vision relentlessly, and Falcon is confirmed as part of the team which will rescue Vision and Scarlet Witch. War Machine is a more surprising character, but he fits with certain fan theories; it’s generally believed the Avengers will set a trap for Thanos in Wakanda, using the Mind Stone as bait. Rhodey is confirmed to be part of that final battle; maybe he plays an important role in it? When we last saw the Tesseract, a.k.a. the Space Stone, it was in Odin’s Vault – which, of course, was destroyed in Thor: Ragnarok. Trailers have already confirmed that Loki stole the Tesseract before Asgard’s destruction; it seems he’ll be forced to hand it over to Thanos at long last. So it’s surprising not to see Loki’s face accompanying the Space Stone. Instead, the focal characters are Steve Rogers and Bucky Barnes. Both have a deep history with the Space Stone; it was the MacGuffin in Captain America: The First Avenger, after all. Meanwhile, Nebula fits with what little we know of the film’s plot; having acquired the Space Stone, Thanos appears to head to his homeworld of Titan, and that’s where the trailers have shown a glimpse of Nebula. He uses the Space Stone to get to Titan, and likely to travel back as well. It’s possible Mantis will hitch a ride to Earth with Nebula, explaining her presence on the poster. Shuri is more unexpected. Will the teen genius try to prevent Thanos teleporting into Wakanda? That may explain why Thanos’s Outriders are using dropships in the trailer. You could be forgiven for expecting Doctor Strange and the New York team to appear alongside the Time Stone. Instead, Marvel has placed them in the poster representing the Aether, better known as the Reality Stone. This particular group – Iron Man, Doctor Strange, Wong, and Spider-Man – are confirmed to play a crucial role in the film’s first act, and look to head out into space for the second act as well. This does make a strange sort of sense, though. Magic in the MCU involves the manipulation of reality, meaning Strange and Wong would be able to intuitively understand what Thanos does with the Reality Stone. It’s an interesting decision. As for the Time Stone, that’s the focus for a whole different group. Black Widow and Black Panther are in the prime slots, with Okoye and the Hulk as secondary characters. The combination seems logical; Black Widow and Bruce Banner have a history together, and Okoye is leader of T’Challa’s Dora Milaje. But it’s unclear why this group would be associated with the Time Stone. Now comes perhaps the most exciting of all the posters, the one representing the Power Stone. 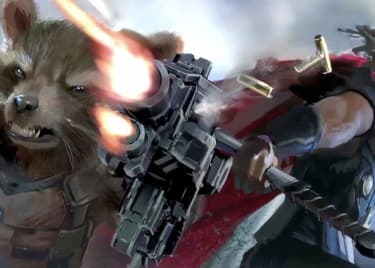 This sees members of the Guardians of the Galaxy teamed up with Thor Odinson. It’s already known that the Guardians discover a battered and defeated Thor, and team up with him on a mysterious side-quest. This may well involve a visit to Xandar, where the Power Stone has been kept since Guardians of the Galaxy. Unfortunately, it’s highly likely Thanos already has the Power Stone. The post-credits scene for Thor: Ragnarok saw the surviving Asgardians confronted by Thanos’s vessel, the Sanctuary II. It seems likely Thanos will swiftly force Loki to give him the Space Stone. 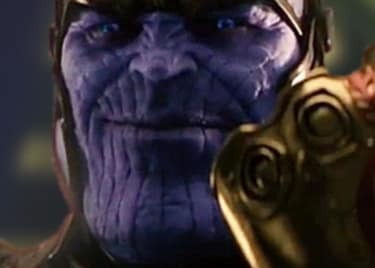 But every image showing Thanos add the Space Stone to his gauntlet has confirmed that the Power stone is already there. If the Guardians and Thor do head to Xandar, it will likely be to a ravaged planet. There definitely does seem to be logic to the character placements in the Infinity War posters. At the same time, some of the choices are frankly bizarre; why is Shuri connected to the Space Stone, for example? And what does Black Widow have to do with the Time Stone? We don’t yet know whether or not there’s anything to these fan theories, but it won’t be long before we find out. 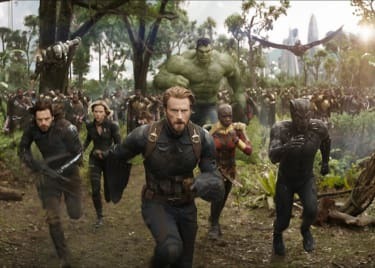 See Avengers: Infinity War when it opens on April 27.